UPDATED – RICHMOND, Va. (CNS) — Bishop Francis X. DiLorenzo of Richmond died at St. Mary’s Hospital in Richmond late Aug. 17 from heart and kidney failure. He was 75. “During my tenure in the Diocese of Arlington, it has been a privilege to serve and collaborate with him,” said the bishop, who was installed to head the Northern Virginia diocese last December. Before that, he was the Bishop of Raleigh, North Carolina. Then-Father DiLorenzo served as chaplain and instructor in theology at St. Pius X High School, Pottstown, Pennsylvania, from 1975 to 1977. In 1977, he was appointed chaplain and associate professor of moral theology at Immaculata College. He is widely credited with saving Catholic schools in the Richmond Diocese with the formation of the McMahon-Parater Foundation, whose mission is to strengthen schools by providing scholarships and financial assistance, as well as professional development. In addition to Catholic schools, he encouraged education of lay Catholics, and under his leadership founded the Lay Ecclesial Ministry Institute to better equip parish leaders to teach the faith to children and adults. 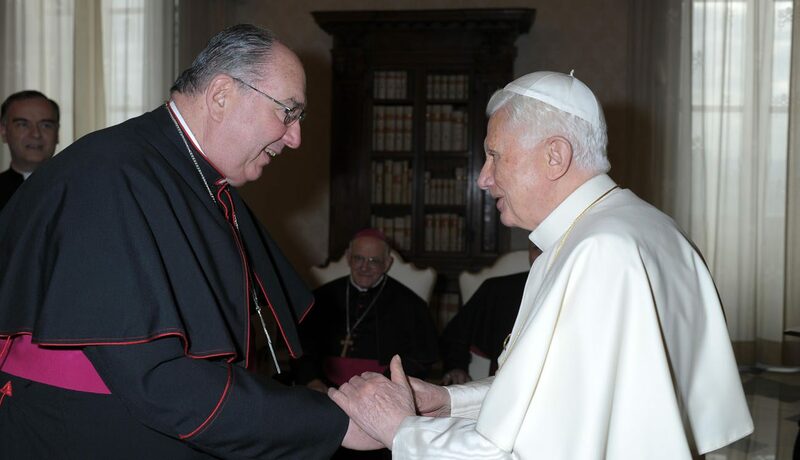 On the national level over the years, he had been a member of the USCCB’s Administrative Committee, Committee on Doctrine and Ad Hoc Committee on Bishops’ Life and Ministry. He was chairman of the conference’s Committee on Science and Human Values. He helped launch a series of teaching brochures on the relationship of science and religion and on bioethical issues such as genetic testing and screening of embryos. I knew the bishop threw occasional encounters and by reputation as he served in my parents Diocese. He stepped into a difficult situation in the diocese Richmond and gave a great example to all of standing with Christ he strengthened the diocese and Orthodoxy vocations and brought stability to the diocese he will be missed. I’m now serving as a religious priest in the Diocese of Philadelphia I appreciate his witness in my parents diocese in Virginia. Bishop DiLorenzo had a personality that was larger than life and I considered him a dear friend. I first met him as I was an altar boy at Saint Johns the Evangelist church in Lower Makefield, Pa in the early 1970’s. I remember him taking the altar boys for pizza after we had celebrated the Stations of the cross during the Easter season in his Mustang he so dearly loved. It was not uncommon to hear his laughter coming from the back of the church as he greeted parishioner’s in the back of the church or his quick with during a homily. One thing was certain , his love for God and his mission to spread the word. After many years we re-connected as he took over in the Diocese of Honolulu. We eventually had the opportunity to meet on the eve of Archbishop John Krol’s funeral in 1996. It had been over 20 years since we had met but it seemed like it was the day before. He was in from Honolulu to give the homily for a mass the night before Cardinal Krols funeral. As always his massage was powerful and echoed love and devotion to the church.